A dear friend of mine sent me this image after I received some recent bad news. 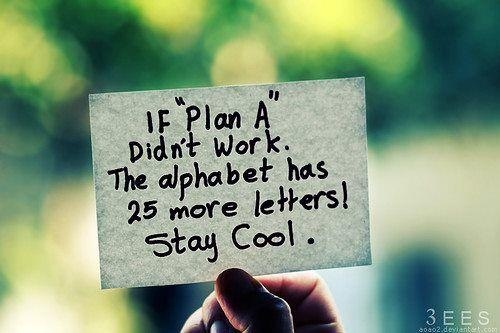 I loved the image, and I loved the reminder that there are many options, there are many ways, and if “Plan A” fails, that does not mean that we have failed. A few weeks ago I started putting together an adoption website. I had lingered around the idea for months, many months, yet the day I started I realized that though Plan A, B, C, and D had not worked, that did not mean that the very next plan would not. When we are open to the answer that comes when asking ourselves “what next?,” we find that doors crack open to show us a new light, a new path, a new plan. If you have been feeling dejected, defective, deficient, devalued, and devastated, remember that just because “Plan A” on your path to motherhood did not work, does not mean that you will never be a mother. The alphabet has 25 more letters! Stay cool. love this! good luck with the new website. ← Stress & Infertility: How resilient are you?